“Going for an early morning run in El Moro Canyon is an unforgettable experience. Despite its familiarity, it somehow feels a tad different every time. The sensory barrage around each turn is a welcome change from the office setting that will occupy the rest of my day. Each point in the breathtaking landscape leaves a lasting memory, one that I myself help create as I move through the landscape. Much of our lives is spent moving and exploring in the same way, crafting experiences that are the result of our unique interactions with the world. 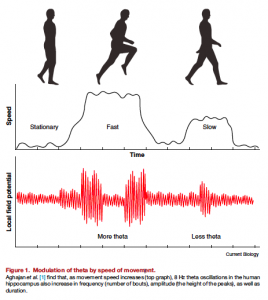 >> Brain Rhythms: Higher-Frequency Theta Oscillations Make Sense in Moving Humans by Dr. Michael Yassa, published today in Current Biology Dispatches, a CellPress journal.